Benjamin West (American, 1738 - 1820), Maria Hamilton Beckford (Mrs. William Beckford), 1799, oil on canvas, Andrew W. Mellon Collection, National Museum of Art, Washington D. C.
The Beckford Women is a temporary exhibition that presents a fascinating and successful exploration of the creative lives and labours of several women who influenced the antiquarian and collector William Beckford (1760 – 1844). This small but important display is on show at Beckford’s Tower and Museum, a remarkable site looked after by Bath Preservation Trust and situated just outside the city. Beckford himself is largely remembered as the author of the Gothic novel Vathek, originally published in 1786, and for the ill-fated Fonthill Abbey he built in Wiltshire. Beckford’s Tower, known originally as Lansdown Tower, was erected in 1827 to the designs of architect Henry Goodridge. Built as a library to house Beckford’s vast collection of books, the tower served as a retreat from the busy and fashionable city below. The modern-day visitor is invited to ascend its spiral staircase and enter one of two rooms, now sadly devoid of books but filled instead with an impressive array of contemporary prints, engravings and a scale model of Fonthill. The Beckford Women display sits alongside these permanent exhibits, adding a previously obscured yet vital narrative to the museum. Through letters, journals and portraiture, this display gives voice to a rich and interesting cast of women. Following the basic chronology of Beckford’s life, the exhibition first introduces us to Lady Catherine Hamilton (1738 – 1782). Catherine was the wife of the antiquarian and envoy to Naples, Sir William Hamilton (1730 – 1803), a second cousin of Beckford’s. As well as showing a copy of David Allen’s 1770 portrait of Sir William and his wife in their villa in Naples and accompanying extracts from letters, the display proposes Catherine’s central role in Beckford’s early experiences in Italy during his Grand Tour. I fear I shall never be so sapient nor good for anything in the world, but composing airs, building towers, forming gardens, collecting old Japan, and writing a journey to China or the moon. There are not many to whom I could make so extravagant a confession, but in you, my dear Lady Hamilton, I place my whole sole of confidence. William Beckford to Lady Catherine Hamilton, 2 April 1781. 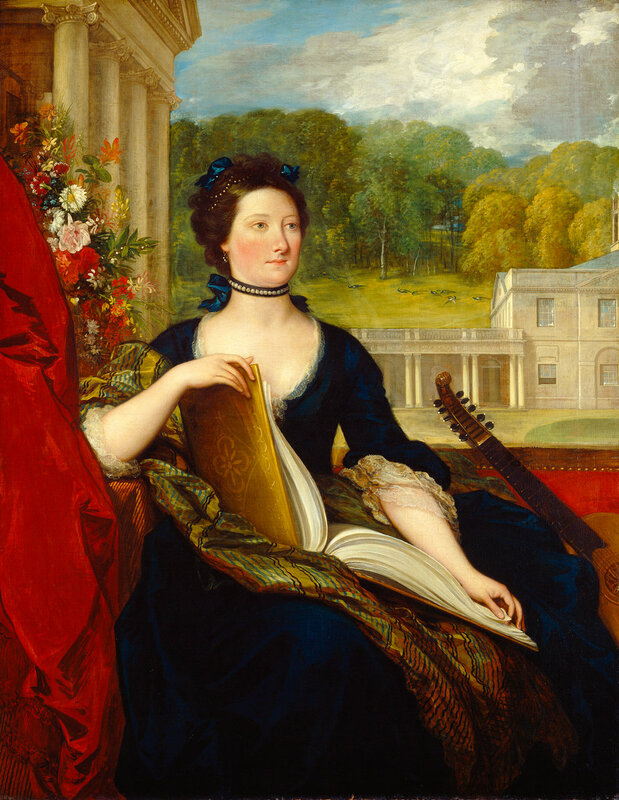 Next, we meet two of the women who would go on to feature prominently in Beckford’s romantic life – his lover Louisa Pitt Beckford (1754 – 1791) and wife Lady Margaret Gordon (1762 – 1786). Beckford met Louisa, the wife of his cousin Sir Peter Beckford, at Christmas 1799 and began an affair that, the exhibition tells us, would last “even through Beckford’s relationship with William Courtney.” Although Beckford’s relationship with William “Kitty” Courtenay, 9th Earl of Devon (c. 1768 –1835) is mentioned elsewhere in the exhibition, any examination of his homosexuality is disappointingly not further explored. By contrast, Beckford’s marriage to Lady Margaret, begun in 1783, is presented as unrequited devotion on her side – she accompanied him in his exile to Europe following the exposé of his and Courtney’s affair. Presented alongside each other in the same display case, both women are represented via reproduced portraits and printed text including their correspondence with Beckford. Regrettably, the display does not feature any objects associated with the women that might indicate something of the material culture that contoured and sustained Beckford’s circle – an absence made all the more poignant when one considers Beckford’s illustrious career as a collector of art and antiquities. This, however, may be due to a lack of surviving material, which in itself raises interesting questions about the historic preservation and prioritising of objects connected to elite women. A series of extracts from letters and journals also lends animation to the unusual and intriguing lives of Beckford’s two daughters, both the result of his marriage to Margaret. His youngest daughter, Susan Euphemia Beckford (1786 – 1859) was born in Chateau La Tour in Switzerland during his exile. On his death, she inherited Beckford’s estate and was responsible for transferring his entire collection and vast library from Bath to Hamilton Palace in Scotland. However, it is his eldest daughter, Margaret Maria Elizabeth Beckford (1784 – 1818), whose story is most engagingly portrayed. In 1811, Beckford disowned her after she eloped with Colonel James Orde. A defiant letter, written by Margaret to her father at the moment of her elopement, is particularly effective. The triumph of the exhibition, however, is its insistence on making visible the works of Beckford’s half-sister, the novelist Elizabeth Hervey (c. 1748 – 1820). Here, extracts from her journal reveal Beckford’s dismissal of her writings, whilst copies of Melissa and Marcia (1788), Louisa (1790), The History of Ned Evans (1796) and The Church of St Siffrid (1797) are displayed alongside Hervey’s 1815 copy of Beckford’s infamous Gothic work Vathek. Despite its relatively small size and scope, The Beckford Women convincingly addresses the biographies of several women in Beckford’s close circle through engagement with a range of textual and visual sources. Although any exhibition that examines the lives and works of women only in relation to a male figure is always going to come up against problematic limitation, the display provokes interesting questions about the value and previous invisibility of women’s intellectual and social influence. Although on a modest scale, The Beckford Women can happily be listed alongside other, larger-scale exhibitions such as Mrs Delany & Her Circle (Yale Centre for British Art, 2009) and, more recently, Enlightened Princesses (Historic Royal Palaces, 2017) in its ambitious efforts to prioritise and advance the often-hidden histories of eighteenth-century women. The Beckford Women is at Beckford’s Tower and Museum in Bath until 28 October 2018.